Prepare matzo ball mix according to package directions, but use BOTH packets, 4 eggs, and 4 tablespoons oil. Add the shallots, carrots, and red pepper and blend well. Bring oil to a boil in a small pot. Wet hands and form batter into matzo balls, approximately 1 inch in diameter. 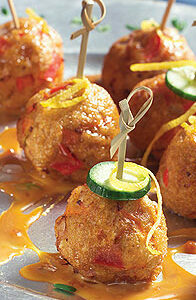 Drop a few balls at a time into the boiling oil and let them fry for about 1 minute or until they float to the top. Remove from pot and place them on a paper towel. Repeat until all the batter is used. Make the sauce. Mix all the ingredients well in a small bowl until well combined. Note: These can be made dairy by adding about 1/2 cup shredded cheese (mozzarella or cheddar) into the mixture. Serve with heated marinara sauce for a great dipping option.